Do you suffer from a crippling fear of rose-tinted wines? Do you wander the aisles of the wine shop, shielding your eyes from bottles filled with cheerful pink liquid? Do you find yourself frustrated on a hot summer day when a glass of room-temperature red is insufficiently refreshing yet white seems insubstantial for pairing with your barbecued fare? If you answered “yes” to any of these questions, you may be suffering from a debilitating condition known in the oenophile community as “roséphobia.” If you or a loved one is suffering from this disorder, do not despair—hope is on the horizon. The most effective treatment to combat roséphobia is exposure therapy. Many sufferers are simply unaware of the breadth and depth of styles of rosé wine available on the market, especially those who are traumatized by flashbacks of saccharine Mateus and other similar products popular in the second half of the 20th century. However, these distressing memories can quickly become a thing of the past through the discovery of dry, high-quality rosés, particularly those hailing from the Provence region of southeastern France. This treatment may be administered under the counsel of a skilled professional, but roséphobics may also explore these wines on their own, taking comfort in the knowledge that just about any bottle is a safe bet. Unlike the nearly neon-hued, sugary blush wines of (mostly) yesteryear, the rosés of Provence possess an appealing pale salmon color that is easy on the eyes. This visual aspect is important, as the first sensory interaction a roséphobic will have with a wine is the observation of its pigment. The delicate appearance of Provençal rosé can provide reassurance to those undergoing therapy that they may expect to consume a wine of balance and finesse. Interference with treatment may occur if a roséphobic makes the false assumption that the muted shade of these wines bears a correlation to a lack of flavor. In fact, these rosés can be quite substantial and structured. Almost always blends, they combine the best assets of various locally grown varieties for a superior flavor profile and mouthfeel. Grenache gives fresh berry aromas, Cinsault adds bright fruitiness, Carignan and Syrah provide body, color, and structure, Tibouren contributes elegance and aromatics, and Mourvèdre lends spice, floral notes, and firm tannins. Awareness of the capabilities of these grapes is an important step in preparing the skeptical roséphobic for the first sip. The next phase of treatment is the tasting. Though it may seem intimidating, former roséphobics have been known to look back on this part as the moment they realized they were cured. It is recommended to combine this step with a proper Provençal meal in order to enhance enjoyment of the wine. For best results, try a traditional bouillabaisse—a seafood stew flavored with olive oil, garlic, saffron, and fresh herbs. Provence’s dry, structured, and zippy rosés with notes of red berries, watermelon, orange citrus, stony minerality, and the local garrigue (a mix of wild Mediterranean herbs including lavender, rosemary, and thyme) are the perfect accompaniment to such a hearty, flavorful dish. On their own, they are equally enjoyable, providing plenty of refreshment without sacrificing substance. 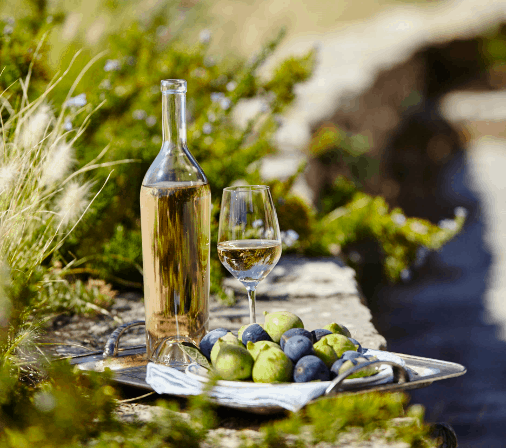 Once you have consumed your first glass of rosé from Provence, you are well on your way to recovery. In fact, you may very well eventually find yourself experiencing symptoms of rosé addiction, which include seeking out high-quality rosé wines from other regions, frequently planning picnics, and compulsively checking the internet for reasonably priced airfare to warm-weather destinations. This should not be cause for concern—eleven out of ten wine professionals agree that a moderate case of rosé addiction can be beneficial for your enjoyment of life. Though the initial diagnosis can be alarming, roséphobia is easily treatable and the prognosis for recovery is strong. If you know someone who is suffering from roséphobia, please help spread the word so that no wine lover is forced to live with this unnecessary and tragic condition.